GOODLETTSVILLE, Tenn. — Dollar General Corp. has opened its 13,000th store, located in Birmingham, Ala. The deep discount chain held a grand opening event for the store, situated at 4132 Jefferson Avenue Southwest in Birmingham, on Saturday. Dollar General plans to open 900 new stores this year. Free $10 gift cards were given to the first 200 customers, and Dollar General also offered goodie bags with complimentary samples, coffee, donuts, hot dogs and drinks for lunch, and food samples of the retailer’s Clover Valley private brand. Visitors also received an official welcome from Dollar General region director Mark Nichols, Birmingham’s director of economic development Lisa Cooper and Midfield, Ala., mayor Gary Richardson. In Alabama, Dollar General has more than 6,500 employees and about 675 stores, as well as a distribution center in Bessemer, which opened in 2012. This morning’s grand opening celebration is one of the planned 900 new stores in 2016 throughout the 43 states Dollar General serves. 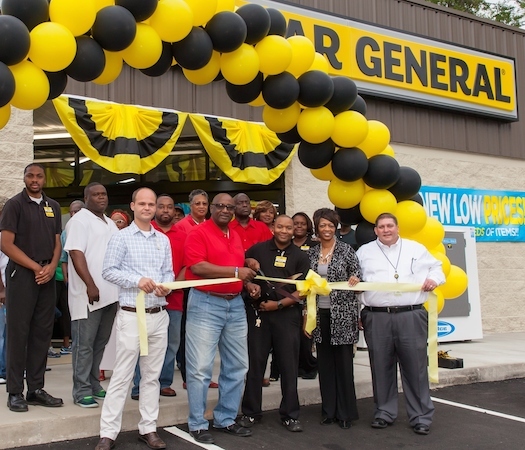 “This morning’s grand opening celebration commemorates a major milestone for Dollar General and reflects our unwavering commitment and dedication to provide convenience and everyday low prices to the communities we serve,” Dollar General chief executive officer Todd Vasos said in a statement on Saturday. With large numbers of smaller-format stores that can penetrate deep into neighborhoods, dollar store chains have presented formidable competition to drug chains in front-end merchandise. Dollar General, for example, sells health and beauty aids, food, snacks, cleaning supplies, basic apparel, housewares and seasonal items at low everyday prices, including strong private labels and branded products from manufacturers such as Clorox, Energizer, Procter & Gamble, Hanes, Coca-Cola, Mars, Unilever, Nestle, Kimberly-Clark, Kellogg’s, General Mills, and PepsiCo. The biggest dollar store retailer, Dollar Tree, operates over 14,000 stores in 48 states and five Canadian provinces under the Dollar Tree, Dollar Tree Canada and Family Dollar banners. The chain’s U.S. Dollar Tree stores carry a selection of items — all priced at $1 or less — that range from candy, snacks, food, health and beauty aids, stationery, and gifts and wrap to housewares, glassware, dinnerware, cleaning supplies, toys, party supplies, craft supplies, teaching supplies, books and seasonal decor.